Housing costs are responsible for pushing a further 229,000 Australian children below the poverty line, a new analysis shows. Source: The Guardian. 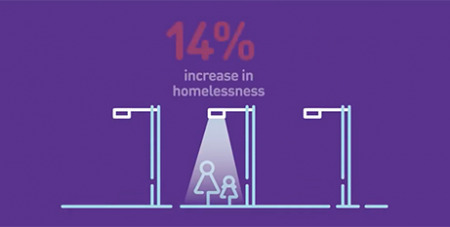 Researchers yesterday released the first longitudinal analysis of homelessness in Australia, showing the impact of stagnant wages and social security rates, inadequate social housing investment and increasing house prices. The report confirms trends seen in the latest census data: rough sleeping is up by 20 per cent in the five years to 2016, overall homelessness has spiked 14 per cent, and demand for homelessness service has increase 22 per cent. But the analysis – commissioned by Launch Housing and prepared by the universities of NSW and Queensland – goes deeper, seeking to understand the consequences of policy inaction. It finds, among other things, that the costs of housing are driving up the poverty rate by 3.3 per cent points, to 13.3 per cent. The cost of housing causes an additional 613,000 people to fall below the poverty line, using 2013-14 figures. That includes 229,000 children. Property prices have increased by 80 per cent in the past decade, while median household income grew by 40per cent. Overcrowding has increased by 88per cent. The report also finds Indigenous Australians are 10 times more likely to experience homelessness, and the number of older Australians (aged 55 to 74) experiencing homelessness has grown 55 per cent in the decade to 2016. The report finds that policy inaction on housing affordability has driven up homelessness. Tony Keenan, the chief executive of Launch Housing, described the situation as a “national disgrace”. Keenan said the data in the report, named the Australian Homelessness Monitor, should serve as a blueprint for action. “Governments and decision makers have been stuck in a policy echo chamber,” he said. “There are tangible things that state and federal governments can do now to fix Australia’s housing crisis. We cannot go on shutting our doors.